HITT Contracting Inc.’s Atlanta office hosted an event to help make the holidays a little brighter for children throughout Georgia. 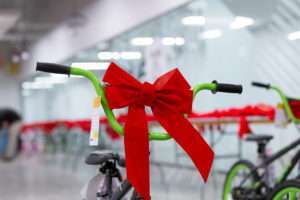 Dubbed the Big Bike Build, the event brought together several of the organizations currently managing construction of NCR’s new Midtown headquarters in support of one common goal: to build bikes for Toys for Tots. On the day of the event, more than 200 people converged on the NCR job site, taking turns assembling bikes, inflating tires, checking work, and tying a bow on each finished product. By the end of the day, the team built 1,006 bikes, but the generosity didn’t stop there. In addition to the bikes, they presented the Atlanta chapter of Toys for Tots with a check for $25,000. Recognized for an AIA Georgia 2016 Merit Award, the Cardlytics office at Ponce City Market is “a design that successfully engenders warmth and interest”. AJ Glass worked with architects Smith Dalia Architects, LLC and GC Humphries & Co. to fabricate, design and engineer custom glass doors that added natural light to the space. Learn more about the American Institute of Architects recognition here and take a look at the project photos in our portfolio.